Ag Building is now looking bright and festive! 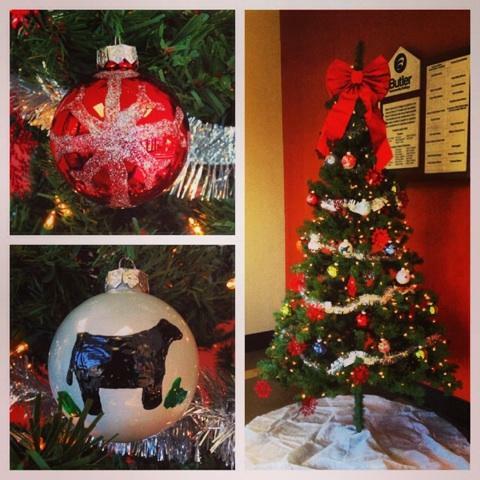 Last night Ag Ambassadors met to decorate the tree and brighten up the Ag Building! It was a nice break for the students from studying for finals! The tree is now setup and displayed in the lobby with a variety of ornaments that members decorated with their own personal touch! It has been a busy fall and the officers have been busy with livestock judging so our posts have been MIA and we apologize but we will try to keep you updated on future events but for now we thought we would spread a little Christmas Cheer! Happy Holidays! Enjoy your time with family and friends! This entry was posted on December 10, 2013 at 5:45 pm and is filed under Uncategorized. You can subscribe via RSS 2.0 feed to this post's comments. You can comment below, or link to this permanent URL from your own site.